When you're considering a move to an off-grid environment, you might think that being technologically-savvy or having a green thumb are some of the most important characteristics for you to possess. After all, you have to feel comfortable with constructing your own power system and planting your own food supply. Instead, creativity and ingenuity may actually be the most crucial. Something as simple as a shipping container can be used to successfully build an off-grid life if you have the creativity. One man has even dedicated his entire business to doing just that. It offers a cool option for potential off-gridders who are looking to have some help when transitioning to a completely sustainable and independent home. 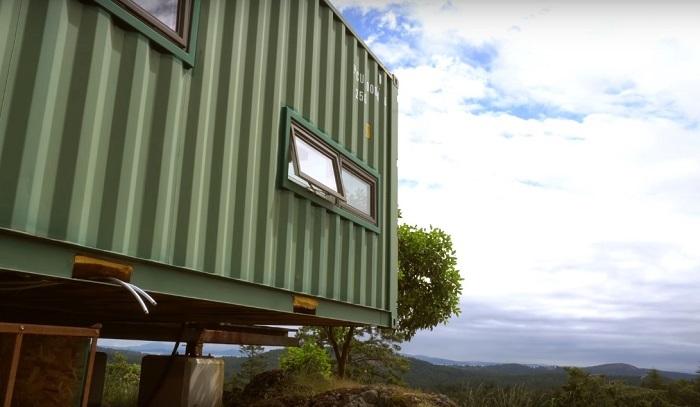 Keep reading to learn how this man has transformed a shipping container into a fully off-grid home with plenty of light and a beautiful view! Bob you must learn how to spell the word receive !!! I’ve seen several on TV shows showing unique homes. Just don’t burry them or they will collapse. That is unless you reinforce them. This is a good page you n bub should be on.